In addition to providing online and on-site training, Your Licence also offer a range of courses delivered face-to-face with registered assessors in Melbourne, Victoria. 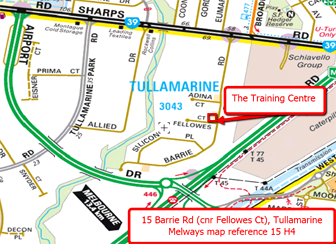 The Training Centre used by Your Licence Pty Ltd and our RTO partner, Aitac Pty Ltd, is in Tullamarine. Located just over 20km from the Melbourne CBD, the facility is close to the airport and is easily accessible by car or public transport. To discuss your training requirements, please feel free to contact us.